Unless you've been in hiding you'll know that Rio is hosting the 2016 Olympics and Team GB is doing amazing work standing currently 2nd in the medal table knocking out Olympic Records, World Records and taking medals in sports, such as gymnastics, we never have before. And so as the Olympics enters its last week before Team GB's Paralympians take over, we wanted to introduce some of the Olympic Dogs sitting patiently at home, cheering on their owners and waiting to welcome them home. Laura and Jason have been storming through the cycling events at Rio's Olympics taking no less than three gold medals between them so far with Laura still to compete in the Omnium event so another medal could be on the horizon! At home the couple own two Sproodles, Sprolo and Pringle who are clearly a massive part of their home life with Laura quoted as saying that her boys are her world. Laura, pictured below, is with her two dogs and her parent's dog, Rupert. Laura is clearly in good form as she and her team made a new World Record in the team pursuit which won them gold, so we're wishing her lots of luck in the Omnium event! Adam smashed the world record in the men's 100 metre breaststroke taking gold in the swimming event and went on to win silver in the men's 4 x 100m medley swimming relay. He's been quoted as saying when he's out of the pool he tries not to think about swimming so he can get some decent rest and recovery in. His dog, Monty is a big part of how he manages this. After Adam won gold his nan started trending (#OlympicNan), Monty also found fame photobombing the family at home's piece with Newsbeat. He's a star in the making, we can tell. After winning gold at the London 2012 Olympics, Jessica Ennis-Hill had a really busy few years, including becoming a full time mum. Juggling work with life, she's said her home life comes first. Her chocolate Labrador, Myla, is a part of her family life, alongside her son, Reggie and the family's days out are often captured in special moments across her social media account. Jessica won silver at this year's Rio games in the Heptathlon event. Congrats! Grace has just qualified for the final of the women's three-metre springboard in Rio. The diver from Edinburgh went to Rio full of confidence after winning a bronze in London earlier this year. Her Cocker Spaniel Ollie (AKA Mr Ollie) is a regular on her Instagram profile and we wholeheartedly agree with this move. Wishing Grace all the best in the next round of her event, we - alongside Mr Ollie I'm sure - will be glued to the TV watching. Becky James has had a tough few years so winning silver in the women's keirin cycling event left her overjoyed and in good form for the women's sprint event where she set a new Olympic Record in qualifying securing her place in the quarter finals. Her Olympic Dog is the incredibly photogenic Dachshund, Lola. Becky has been quoted on Twitter saying she wishes she could text her dog to keep in touch while she's away. For what it's worth Becky, you're not alone. Team GB's Paralympic swimmer Harriet Lee told us in exchange for texting she'll be Facetiming her two dogs when in Rio. Britain's most successful tennis player might have retained his gold medal in the men's singles event (becoming the first tennis player to win two Olympic singles titles in a row) but he knows his family on both four and two legs love him no matter what. 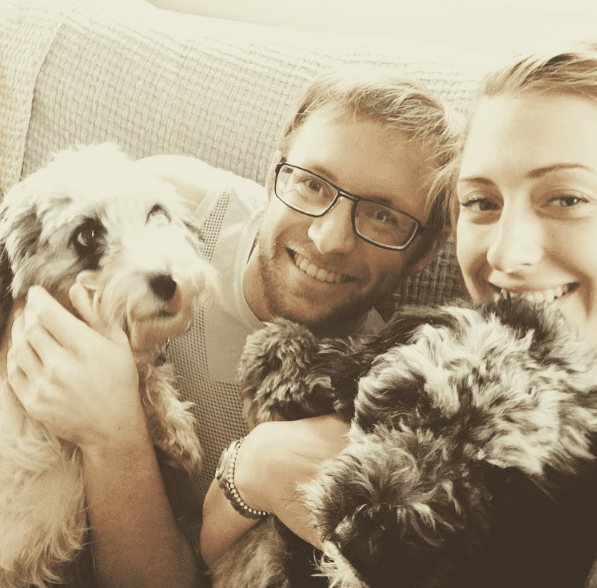 His dogs, Maggie and Rusty are regularly featured on his social media accounts showing he and his dogs are also a fan of keeping in touch using technology such as Facetime when he's away from home. Maggie, the older of his two Border Terriers has her own Twitter account and book out later this year called 'How to Look After Your Human', co-authored by Andy's wife who is also a fantastic artist, Kim Sears. With or without medals, they'd get the same wagging tail and wet nose welcome. But from all of us to all of you, great job Team GB!